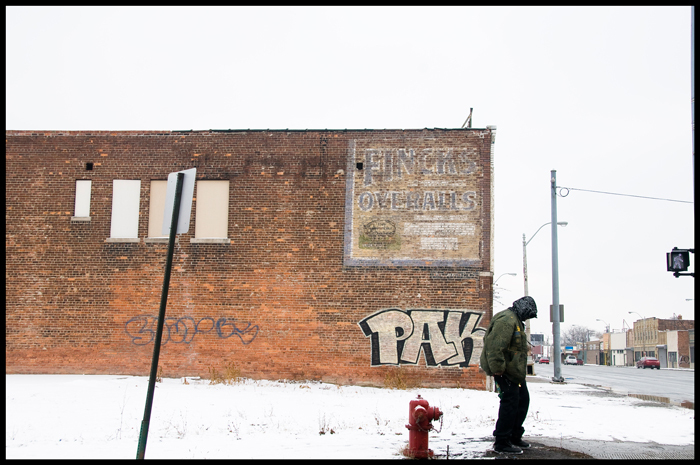 A few months ago I found this ghost sign curious enough to go home and google the name of the company that paid for someone to paint it over a century ago. We do not pretend to be guided in our business by motives of sheer charity, benevolence or philanthropy. In our relations with our customers and our employees we try to treat each in a fair and honest manner, and expect to receive the same from them in return. We are manufacturing working clothing for profit. Not the profit of this month, or this year, but for the profits that will follow years of enterprise, activity and honest dealing. We are ambitious: We want a factory that will be second to none in quality of out-put and we want this out-put to pay. Good materials, inexpertly put together by cheap labor do not pay the manufacturer. 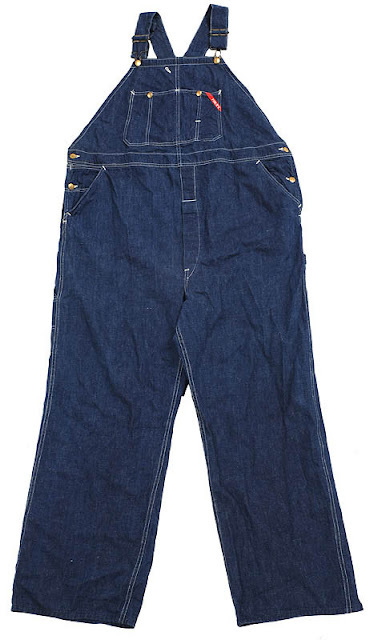 Low-grade materials tastefully, neatly and carefully made into garments by skilled workers do not pay. We are well aware that the men that wear working clothing want full value for their money. We know that when purchasing a garment they examine it carefully to see if it is well made of durable goods. If it does not give the service that they can justly expect to receive in return for their money, they will not care to wear a garment of the same make again. To make perfect garments that we can “guarantee superior to any,” we have combined perfect materials and perfect workmanship. This policy may not allow us as large a margin on a single garment as other manufacturers receive, but it gives us satisfied customers who appreciate the highest grade of goods. Satisfied customers mean an increase in the volume of business, and the increase is our profit. Not only to keep our customers, but to make new friends, we must keep up the high standard that we have set before us. To make an inferior garment would mean failure. We cannot fail. 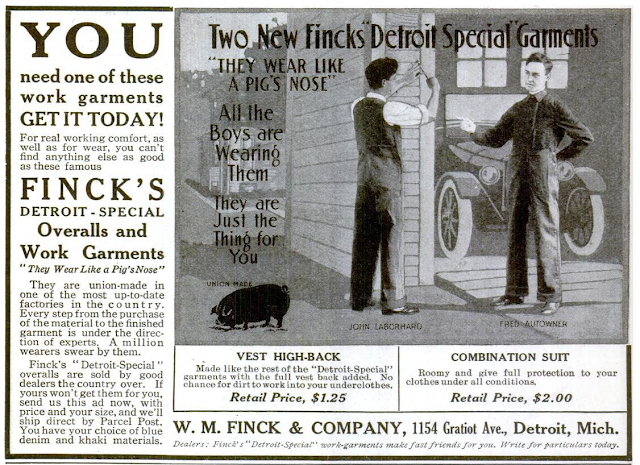 I like this old advertisement identifying potential customers as "John Laborhard" and "Fred Autowner." 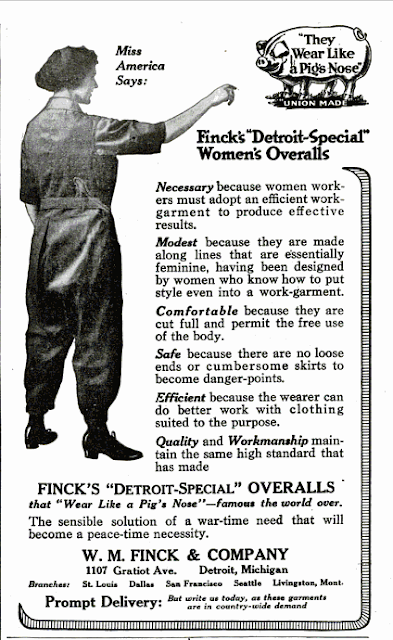 The high standard established By Mr Finck has been maintained by Finck & Company and it is worthy of special note that at the present time Detroit leads all other cities in the United States in this line since here are manufactured fully fifty per cent of all high grade overalls made in the country. In conserving this prestige it is scarcely necessary to say the Finck factory has been the dominating force. 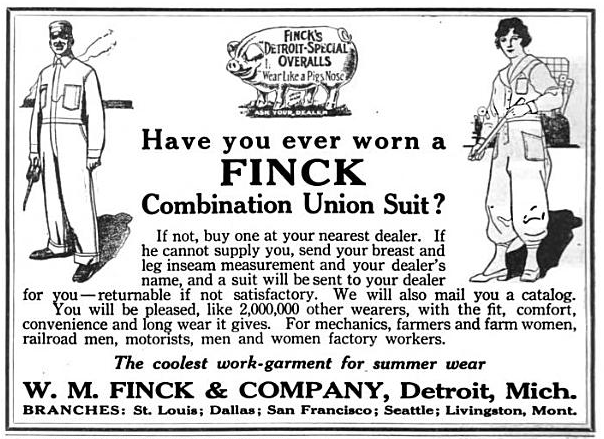 From the beginning of the operations of the firm of Fitzsimmons & Finck sales were made almost entirely on approval of goods as merchants were somewhat loath to introduce goods of so high grade and of prices advanced above those for the greatly inferior products. 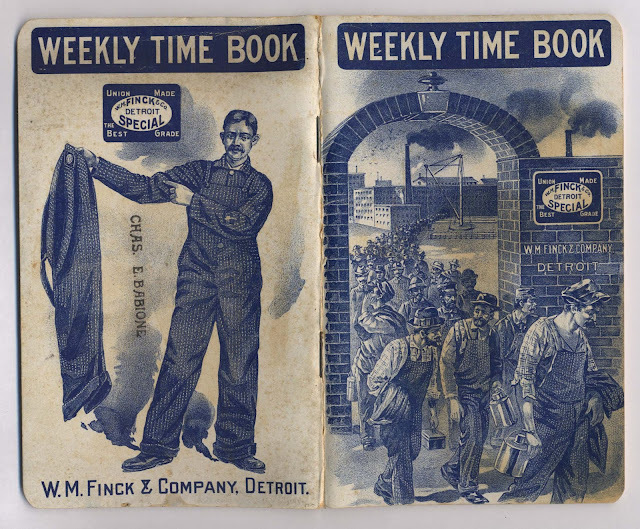 They had been accustomed to handling goods ranging in price from four to five dollars a dozen and with the improved workmanship and superior materials of the Fitzsimmons & Finck products prices ranged from eight to nine dollars a dozen. That the latter products made their value and economy apparent is evident from the fact that the demand has been constantly cumulative from the time of introduction and has resulted in the upbuilding of an industry of magnificent scope and importance. 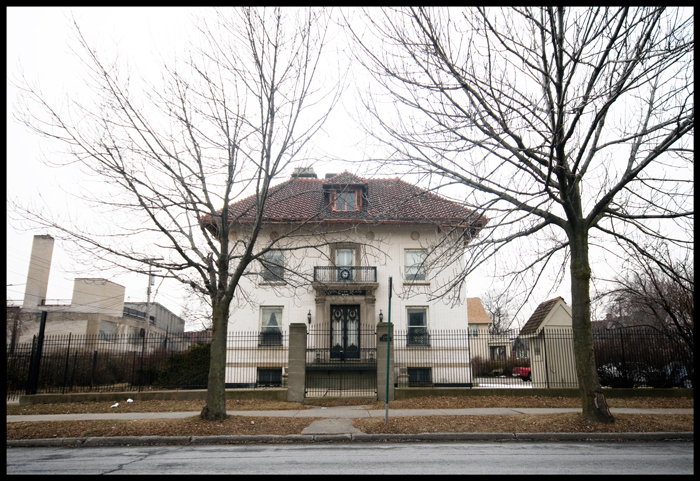 The original quarters secured in Detroit soon proved entirely inadequate to accommodate the constantly expanding business and in 1886 Fitzsimmons & Finck purchased of the late Daniel Scotten two lots of ground near Dix road on Twenty fourth street. On this land was erected a frame factory building one story in height and seventy five by one hundred feet in dimensions. Operations were instituted in this factory with a force of only twenty five hands. 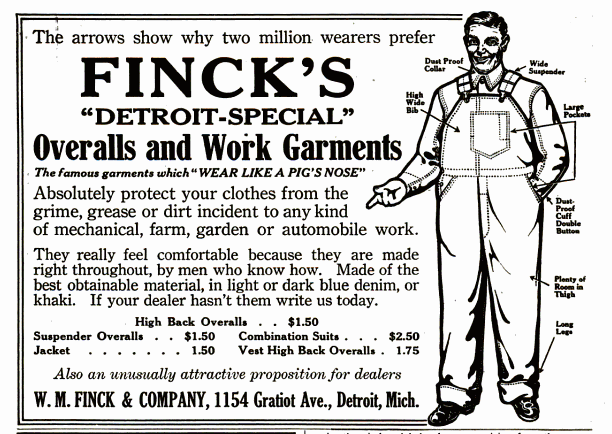 In 1891 Mr Finck withdrew from the firm and associated himself with Hamilton Carhartt forming the firm of Hamilton Carhartt & Company. 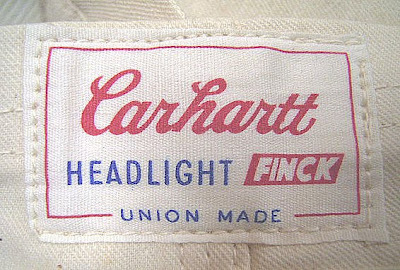 From 1891 until 1902 Mr Finck had direct charge of the manufacturing department of the business of Hamilton Carhartt & Company and in the latter year he retired from the firm to effect the organization of the present corporation of WM Finck & Company in which his associate from the start has been James L. Lee. From the review of the history of the concern on other pages of this volume may be gained an idea as to the wonderful growth of the enterprise within the few intervening years. Mr Lee became associated with W.M. 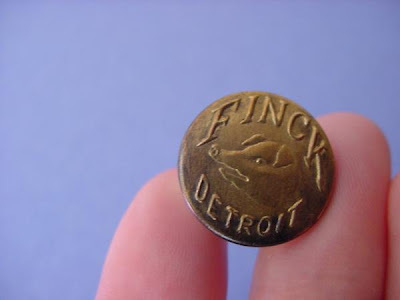 Finck in establishing the firm of WM Finck & Company of which he became treasurer and general manager which offices he has continued to fill and he is also serving as secretary. He acts as purchasing agent has charge of the financing of all advertising for the firm and is also sales manager in which connection he has built up a very efficient corps which comprises twenty five aggressive energetic and successful young salesmen who are securing more orders than the factory can conveniently fill. 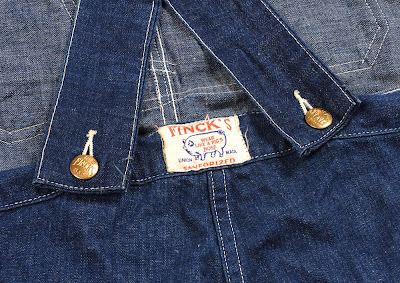 The firm is engaged in the manufacture of overalls on an extensive scale and the excellence of the output has secured for it a worldwide sale. Employment is given to over a thousand persons and the business is thoroughly systematized so that a most efficient organization has been built up In the control of this large enterprise. There are some people to whom it is given the ability to pay unusual attention to details Mr W.M. Finck the senior partner of W.M. 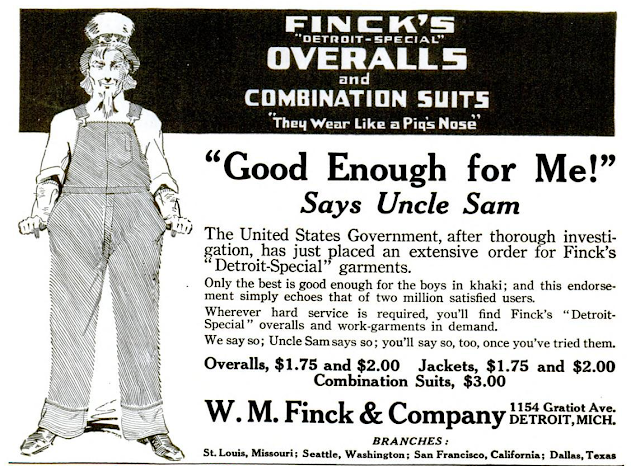 Finck & Company is one of these men. As much as possible in a business which produces such an enormous number of garments a day every garment is given the most careful inspection. If a slight defect cannot be remedied the garment is put aside and relegated to the scrap heap. 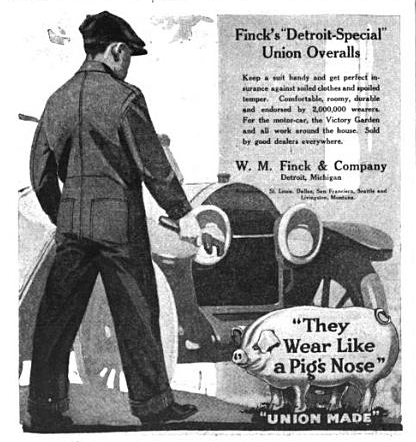 At a meeting of our selling staff in Detroit last December Mr Finck pleaded with our salesmen to send in more complaints about everything that was connected with his business. He figured that the more complaints we received the more perfect our line would become and since that time many improvements have been made in our line of work clothes which up to that time we had thought practically perfect. This then is one of the underlying reasons for the success of our company. 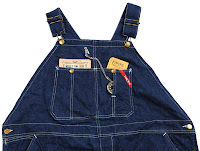 Why write a whole post about overalls? 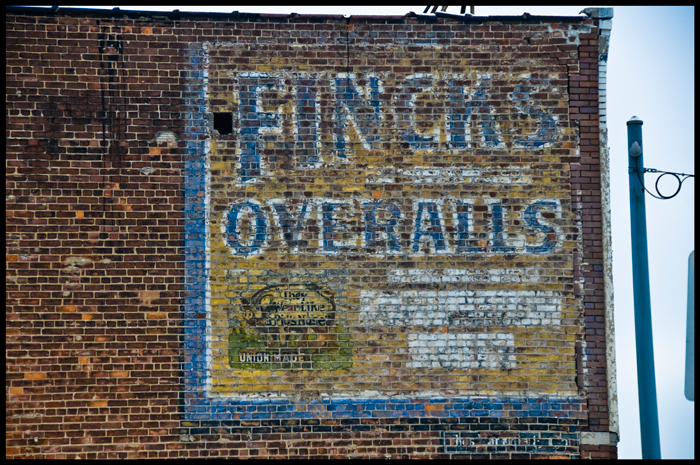 I don't have many occasions to wear them, but I liked how a simple ghost sign led me to discover all this about a company that used to make clothes for people requiring tough clothes in a city where people used to make things.